Open the packaged version of the EPS in Vensim model reader. This is the version of the model with .vpm extension. 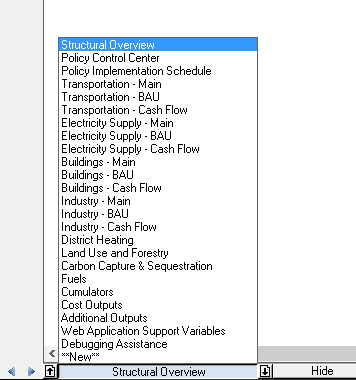 Use the sheet menu to navigate to the Policy Control Center, a sheet from which all policy levers in the model can be accessed. You may navigate around the Policy Control Center page either by using the scroll bars or by pressing and holding your right mouse button and moving the mouse. The policy levers are the variables with names in black text under the headers in blue boxes. 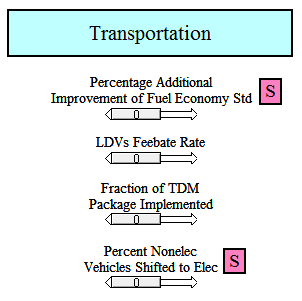 For example, the upper left policy is “Percentage Additional Improvement of Fuel Economy Std” and is in the “Transportation” section. If you wish to enable some policies, you must do this before clicking “Simulate” by clicking the “Sim Setup” button, which appears near the top of the screen, to the left of center. You may now enter a value, such as 0.5 (meaning half of the TDM package will be implemented by the model’s end year). Either press “return” or click elsewhere in the Vensim window to confirm your entry. If you click on “Fraction of TDM Package Implemented” again at this point, the text box that appears will already contain the value of 0.5 that you entered earlier. You may now change the policy settings for each subscripted element by double-clicking its row in the “Constant Changes” window. 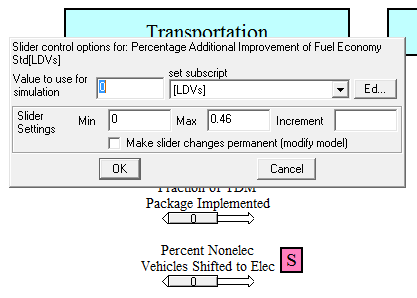 For example, you may enter a value, such as 0.2, for LDVs (light-duty vehicles). 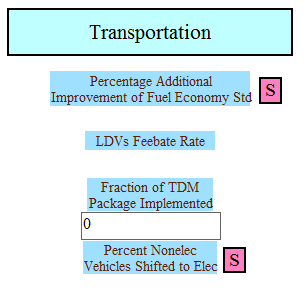 This will improve the fuel economy of LDVs by 20% but will leave the fuel economy of the other vehicle types unchanged. To finish editing an entry, click elsewhere in the “Constant Changes” window or click the “Update” button. You may set different or the same policy values for any or all of the subscripted elements, as desired for the policy scenario you are investigating. 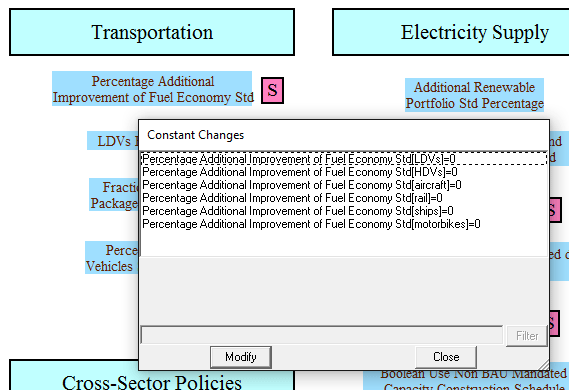 When you are done setting values for this policy, click the “Close” button to close the “Constant Changes” window. If you are uncertain what values would be reasonable, you may consider using SyntheSim mode (discussed below), which includes an upper bound on each policy setting. After you have set values for any policies (both subscripted and non-subscripted policies) that you wish to enter, you are ready to run the simulation. Click the “Simulate” button. Vensim runs the model and the simulation is complete. The graphs below the policy levers on the “Policy Control Center” sheet are updated. For more advanced ways to access and visualize model results, see the Visualizing Output page of this documentation. If you decide that you don’t want to run the simulation after all, you can instead click the “Stop Setup” button. This will exit Sim Setup mode without running the model and without saving the policy setting changes you just made. It can be difficult to edit policy settings this way because the setting for only one element can be viewed at one time. It may be better to click on the small “Ed…” button that appears to the right of the “set subscript” drop-down menu. 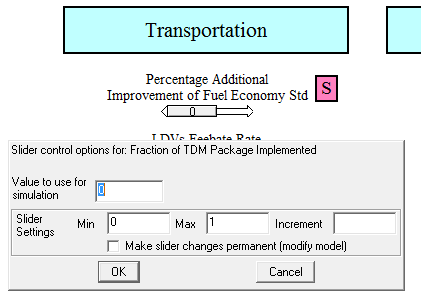 This will open the “Constant Changes” window, which was described above in the “Simulate and Sim Setup” section. You may use this window to set values for any or all of the subscripted elements of the policy. 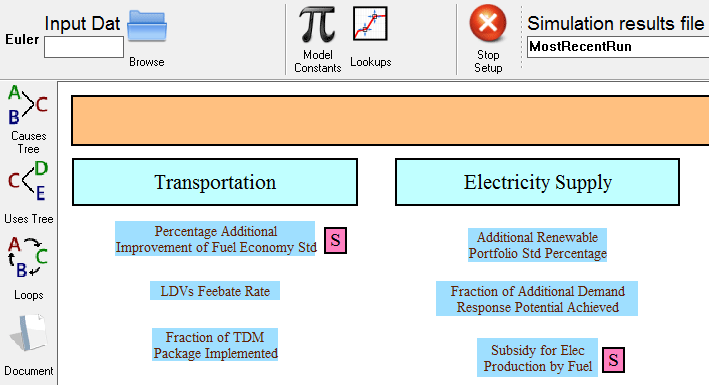 Every time you move a slider or type a policy value while in SyntheSim mode, the model is immediately re-run and the results are displayed on the graphs below the policy sliders. If you wish to reset all of the levers to their default values (all policies turned off), you may click the “Reset all Constants/Lookups to base” button, near the top center of the screen. You may exit SyntheSim mode by clicking the “Stop Setup” button. The values of your policy settings and the model results will be remembered until you begin a new simulation or enter Sim Setup mode.